OK, try to act surprised, but…I didn’t get nearly as much done this week as I would’ve liked. This wouldn’t be so common if I didn’t keep making these HUGE lists of things I want to get done – but then when I don’t have aggressive goals, I do That Thing where I start just sort of wandering around being ADD and nothing gets done. It’s a cruel, cruel conundrum. 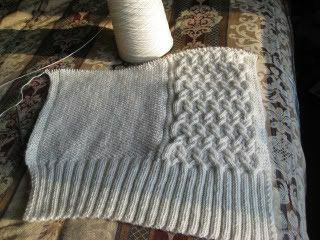 Reversible cables are sooooo cool. 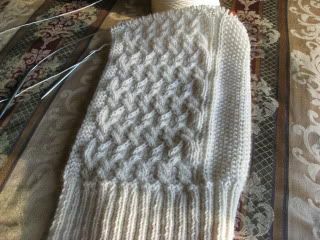 Knitting straight from the cone is neat in terms of fewer ends to run in – but it’s also a bit of a drag when it comes time to take the project on the road. The cone is a bit big, heavy and awkward to drop into your bag, you know? It’s also fraught with peril in terms of not knowing what you might run across as you get deeper into the cone. I don’t know how many folks have dealt with bulk yarn and its occasional foibles – but one of the things that happens with just about every cone I get is that there is some net loss due to things like knots, frays, weird things being spun into the wool (I swear once I found Easter grass in some sock yarn! ), black grease and so forth. In the last shipment I got, the sock yarn in particular had a lot of loss due to knots and an issue where the wool and the nylon appeared to have been spun at different rates; the nylon would be bunched up in little loops, and there was just no way to fix it. The cones averaged around 1,000 grams each, which should have meant I’d get between eight and nine 100 gram skeins to dye – I ended up with between five and six. Worse, I didn’t even end up with many 50 gram skeins – another acceptable put-up for sock yarn. Ooooooh no. The knots / slips / fuzz / weird crap came not at 100+ yard intervals, but…five yards. Ten yards. Maybe twenty. And an awful lot of it was just trash, which is kind of upsetting. Usually when I have to cut out a partial due to knots or other weirdness, I just set aside the whatever-yard skein to make into a finished product for the booth – scarves or mittens or hats or whatever. But when there’s Easter grass spun into the wool? Not gonna become a hat. Or when the nylon and the wool are mixing like oil and water? Can’t fix that with good blocking techniques. So, into the trash it goes – dead loss. And then you weep, because it had such potential! In a lot of ways, the fact that I got a lot of knitting done probably tells you that the rest of the week…didn’t go according to plan much. I spent a lot of time waiting rather than doing - waiting in offices, waiting by the phone, waiting for emails, waiting for kids, waiting for meetings to be over. There are times I wish I had a convincing bobble-headed manikin of myself that I could take to these things, set it up and let it just sit there nodding pleasantly while people went “blah blah blah” and I went on my merry way to actually do something. After all, they seldom actually want me to voice an opinion or anything, you know? I’m just supposed to sit there, nod a lot, and then write a check. Seems to me a manikin should be able to handle that. Still…we had the annual IEP for Captain Adventure this week. This is a long meeting where we talk about progress, lack of progress, goals for progress, and other things around trying to get our little guy closer to “average” for his age. He’s come a long, long way in two short years, and is doing well during his mainstream time in the regular kindergarten class – so well, in fact, that his teacher is hoping to up the amount of time he spends there to include some of the actual academic stuff as well as just circle time, stations and recess. And while I can’t pretend talking about my kids is one of my favorite pastimes, still – basically, that took the entire day on Wednesday. Mostly because for me an “entire day” is only 9:00 to 2:00, so if you drive for an hour and have a two hour meeting and then get lunch, well. Call in the dogs, folks, the day is done. Two of the Denizens joined 4H, which means more paperwork, emails, meetings and oh yeah, now we have Animal Projects. Two cases of Chicken, and one of Rabbit to be precise. Sigh. Oh well, at least we’ll get eggs and a handful angora fiber out of the deal. And according to theory (ho ho ho), the girls will be responsible for feeding, cleaning, tending and otherwise pampering the feathered and furry beasts. Stop laughing. I’m sure they will faithfully uphold their duties. Anyway, I’ve got to figure out coops and hutches and where the heck to put them. And, I still haven’t put away the laundry. You know…someday? I’m going to have a productive week. Someday, I’m going to be on top of everything, and it’s going to be awesome. But it isn’t going to be this week. Next week doesn’t look good, either. The wrap is beautiful! The natural color shows off the cables wonderfully. Looks like you had a very productive week - just not in the way you thought. chicken tractor. Google it. No kidding. you need to rethink the way you define "productive." If you think productive means crossing things off your list, then yeah, ain't gonna happen. But if you think of it as creating something, then Yay for you! You are very productive (garden, knitting, child rearing, etc). Bravo to Captn Adventure for doing so well in school. he really has made great strides. I hear ya! Last week and this week have just been pffffft. Babysitting, being sick, having sick kids, blah blah blah....gee, I just don't understand why my house looks like a disaster area. What a puzzle. Love the wrap - I'm going to have to pick that issue of IK. Chickens are great! What breed are they getting? Some do better in hotter summers than others. We have 11 chickens - they're the lowest maintenance animal we've ever had - and you get eggs! Fabulous eggs! And some of the best organic fertilizer ever. Check out www.backyardchickens.com - great website that'll teach you everything you could need to know. You are very brave. And yes, the chicken tractor is the way to go. Get those chickens to work in your garden eating bugs! Design your tractor so that it's easily maneuverable between your garden beds, and they will do so much to keep the bad bugs down. And hooray for such progress with Captain Adventure!